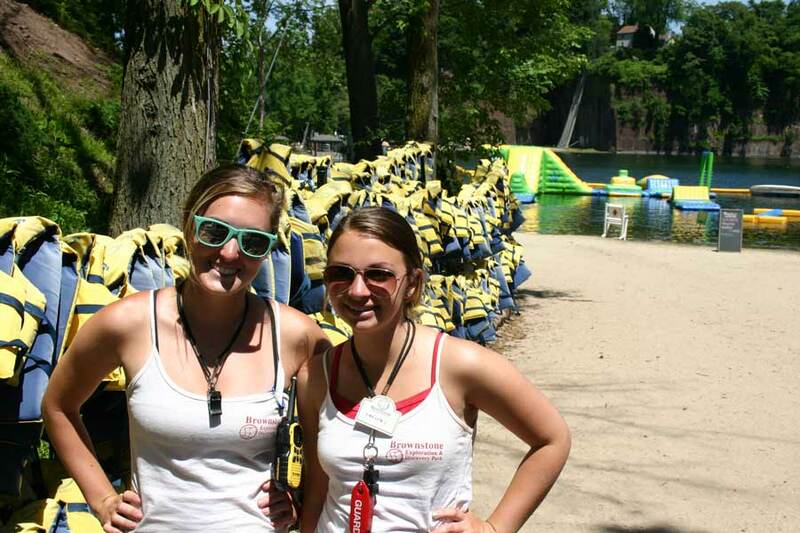 Brownstone Park seeks seasonal employees between May and October. No prior experience is necessary. We are looking for people who understand the importance of staying active and having fun through various sporting activities. In order to be successful in any of the positions available at Brownstone you have to enjoy communicating and assisting people in a friendly and approachable way. All positions at the park require specific dress codes and a well groomed appearance. Our grooming and dress code policies are conditions of employment. More details about the policies are available upon request at the time of the interview. An application must be completed for employment at Brownstone Park. We make our selections from those applicants who most closely meet the job requirements and our standards. Applicant evaluations are based on the following factors: attitude, availability, enthusiasm, communication skills, courtesy, neatness and friendliness. Flexible hours including weekends are available. An application is available in Adobe PDF format. You may deliver your application in person to the park, send your application via US Mail, or complete the application and upload to us via email using the form below. Send applications via postal mail to the address below, or submit your application using the form below. Description: Ticketing Agent must operate computerized p.o.s system, enter guest information, including taking digital photos for season pass holders, sell park daily admission passes. Perform other related duties, as required and assigned. Skills required: Ability to operate computerized ticketing system. Communicate with guests and answer questions regarding park rules and regulations and account for register daily. Description: Various concession positions are available; food service and cashier. Each position must operate a computerized POS system and provide appropriate change and receipts. Provide excellent customer service. Perform other related duties, as required and assigned. Skills required: Ability to operate computerized ticketing system. Communicate with guests and answer questions regarding park policies and procedures and account for register daily. Description: Lifeguards must manage guest water activities for a specific sporting activity and identify and resolve emergencies by utilizing skills acquired in Red Cross Life Guard Certification training. Assist guests with questions concerning activities, directions, and the parks rules and regulations. Perform other related duties, as required and assigned. Brownstone offers American Red Cross life guard classes. Skills required: Must be able to successfully pass the training program and exams; Lifeguard Certification through our training program. Description: Operator is responsible for instructing each guests of the proper way to wakeboard, as well as ensuring that all guests personal gear meet the requirements of the park for the sporting activity. The Instructor must enforce all park rules and regulations, while maintaining guest satisfaction. Perform other related duties, as required and assigned. Skills required: Must be an experienced wake boarder and have the ability to communicate with guests, Duties include providing guest safety and maintaining a safe and clean station by effectively managing equipment and grounds. Description: Instructor is responsible for instructing guests on the proper techniques for rock climbing, as well as ensuring that all guests personal gear meet the requirements of the park for the sporting activity. The Instructor must enforce all park rules and regulations, while maintaining guest satisfaction. Perform other related duties, as required and assigned. Skills required: Must be certified to belay, Brownstone offers certification programs. And have the ability to communicate with guests. Duties include providing guest safety and maintaining a safe and clean station by effectively managing equipment and grounds. Description: Hardworking, dependable laborer responsible for the following activities: assist with opening/closing of the park, cleaning, restocking, assisting guest with harnesses, direct traffic and direct cars in the parking lots. Perform other related duties as required and assigned.